It was drizzling slightly as I pulled my rental car into the car ferry line at Hellesylt and popped into the gift shop for a last-minute purchase of some gloves (who knew it would still be so cold in Norway in May?). As I sat in line and waited for the ferry to arrive, I did some people watching and attempted to do some reading about the fjord that now lay in front of me. As I waited, a bus full of tourists rolled up and emptied into the ferry line, pulling plastic rain ponchos up over their heads. 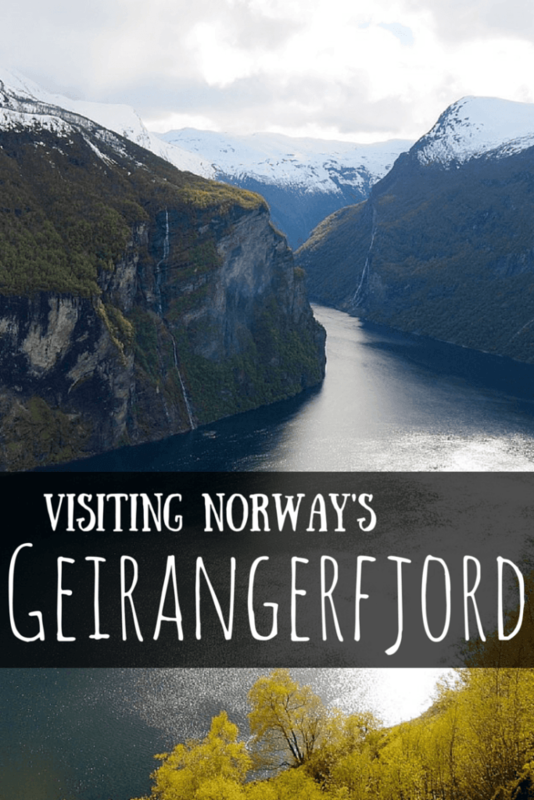 This wasn't surprising, however: Geirangerfjord is arguably the most famous fjord in all of Norway – which is saying something, considering how many fjords Norway contains. 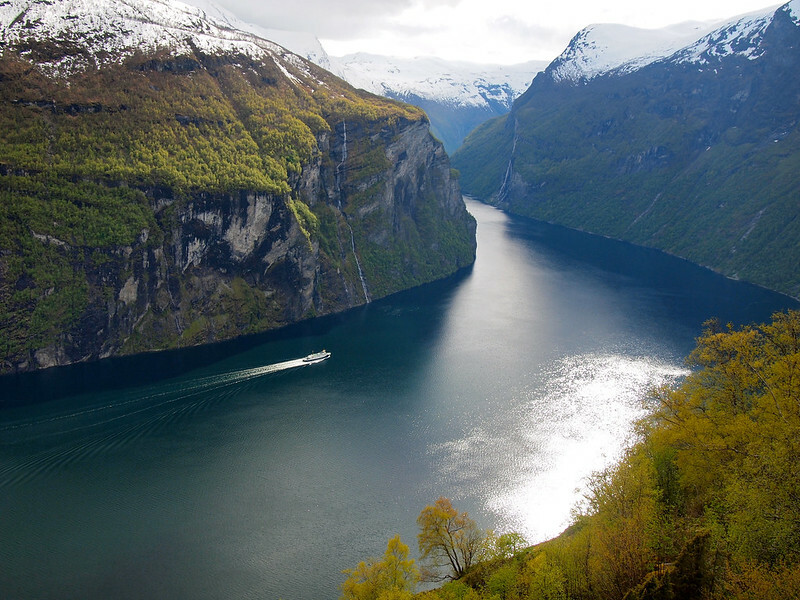 The S-shaped fjord on Norway's west coast is one of the longest and deepest in the world, and is considered an “archetypical fjord landscape and among the most scenically outstanding anywhere,” according to UNESCO. 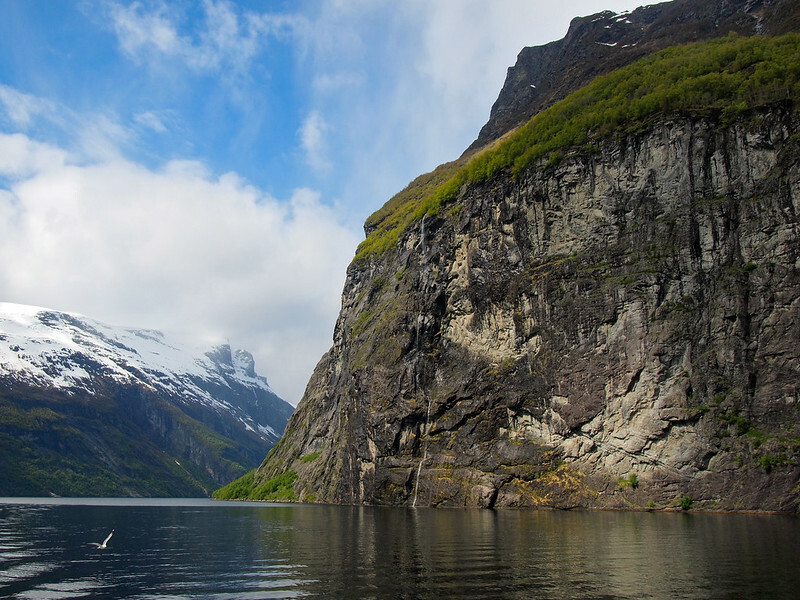 As of 2005, Geirangerfjord – along with nearby Nærøyfjord – was recognized by UNESCO as a World Heritage Site thanks to its incredible beauty. I was understandably excited to see more of it. After I parked my car on the ferry, I headed up to the upper decks for the next hour of sailing 16 kilometers of the famous fjord. All the seats on the top deck were already claimed by the walk-on bus passengers by the time I got up there, but I ended up enjoying the ride much more by switching between the walkways on either side of the ferry. 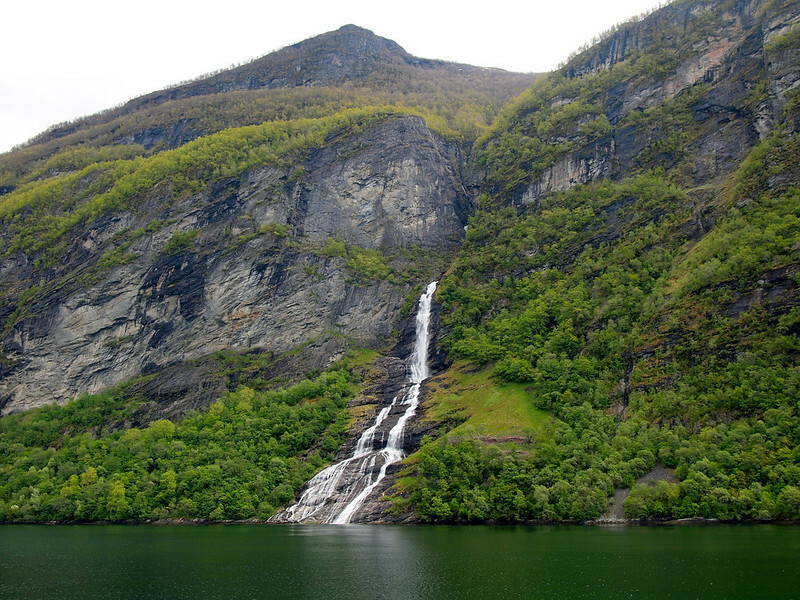 There's no denying that Geirangerfjord is gorgeous. It reminded me a lot of some of the fjords I've visited in New Zealand, with sheer cliffs, dark waters, and cascading waterfalls. 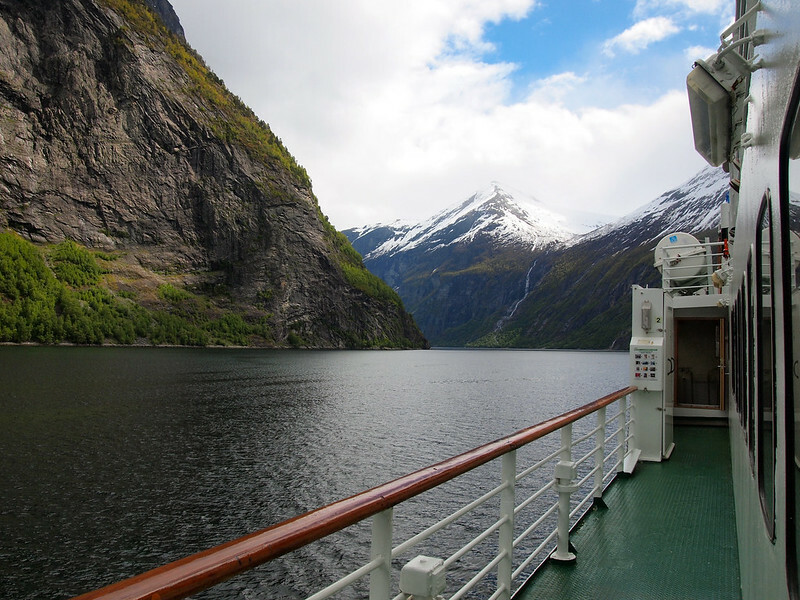 Thankfully the cruise was just the beginning of my adventure in and around Geirangerfjord. As much as I enjoyed sailing through the fjord (yes, even with all the squawking birds), the rest of the day just got better. 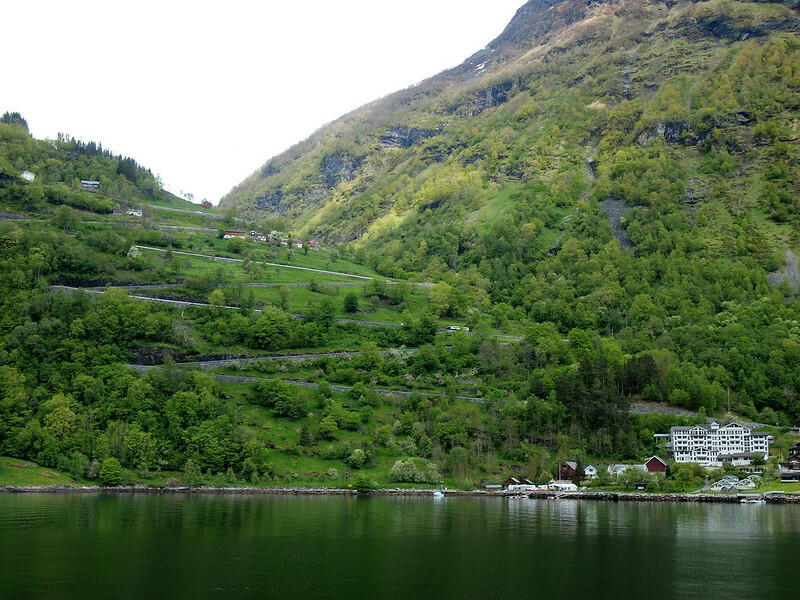 My cruise into the tiny port town of Geiranger was just the start of my Norway fjord adventure. For the rest of the afternoon, I spent my time exploring everything Geiranger has to offer. First order of business once getting off the ferry in the tiny town of Geiranger: food! I headed up the winding roads above the fjord to Westerås Farm, a combination farmstay and rustic restaurant with some AMAZING views. My host, Ove, from the local tourism board recommended the goat to me, but I wasn't quite brave enough to try it (though, lo and behold, I ended up eating goat that night for dinner – and guess what? it was delicious!). Whether you are hankering for goat or not, the views from Westerås Farm alone are worth visiting for lunch. Yes, it's true I had a rental car for my time in Geiranger. However, my hulking Volvo station wagon was a little unwieldy on the narrow, twisting mountain roads surrounding Geiranger. 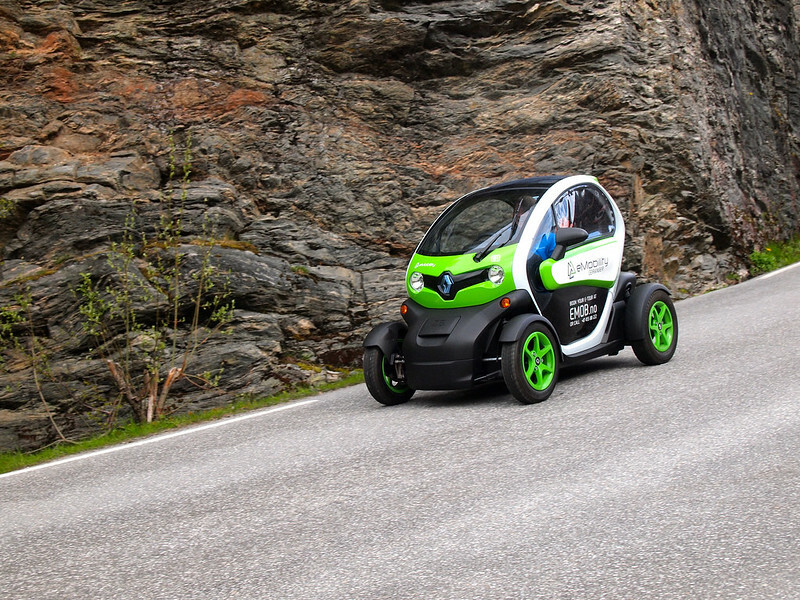 So Ove and I traded my car in for a Twizy from eMobility Geiranger for a couple of hours. Basically it's the tiniest of electric cars with doors that open upwards. The company's slogan in Norway is “Travel without a trace – with a smile!” And that's exactly what we did. I had a smile plastered on my face and was laughing almost the entire time I was driving that tiny car. The way these work in Geiranger is pretty cool. You tell eMobility how long you want to rent a car for (it's 800 NOK or about $98 USD for an hour) and what you'd like to see. They then set you up with a GPS that also acts as a digital guide, sharing fun facts with you about the things you drive past. Ove and I drove to “the Knot,” which you can't drive a regular car through, and stopped off at some of Geiranger's best lookouts along the way. 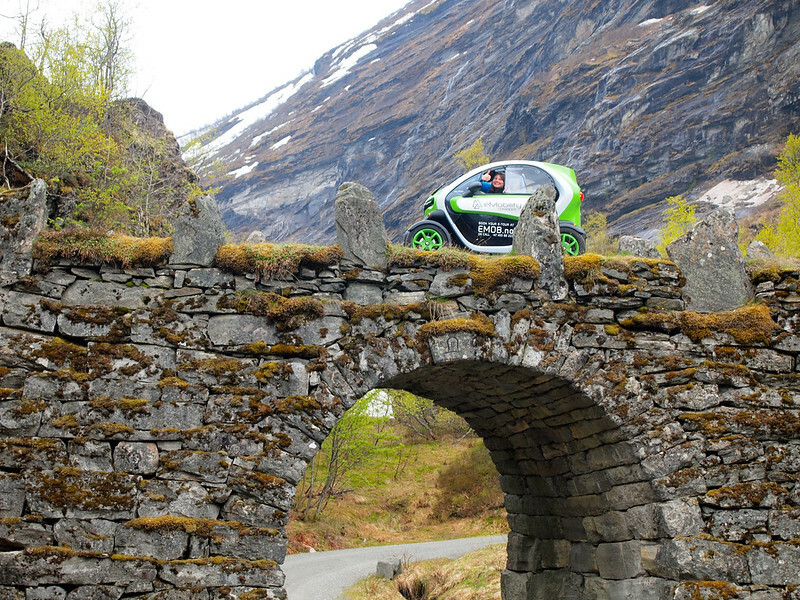 This would be a great option for cruise ship passengers stopping for a day in Geiranger. Speaking of those lookouts, you really, really don't want to miss them. Namely Flydalsjuvet, where you can see one of the most famous views in Norway. This lookout has two parts – an upper and a lower. 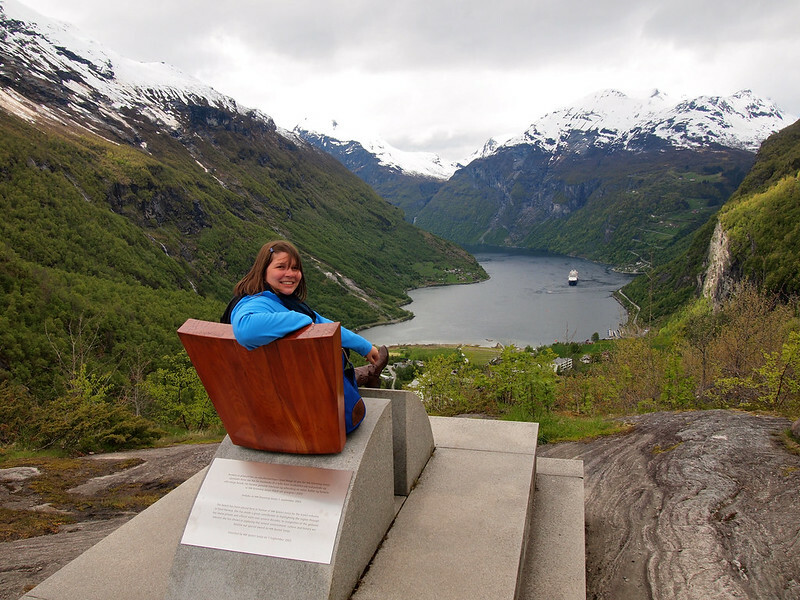 The lower section is where you'll find an installation called “Fjordsetet,” also known as the “Queen's Chair” since it was unveiled by Norway's Queen Sonja in 2003. Best seat in the house, for sure. But I couldn't leave Geiranger without getting THE shot. You know, the one with me standing on top of a precarious-looking rock hanging high over the fjord? This isn't an official part of the lookout (since, you know, danger), but Ove assured me that everyone hops over the 12-inch fence to take the photo anyway. In fact, he even helped me get my epic shots. Our time in the Twizy had to come to an end, but I still had one more great view to see in Geiranger. I took my rental car (which now seemed even MORE huge in comparison to the minuscule electric car I'd just been driving around) up the Ørnevegen, or Eagle's Road. 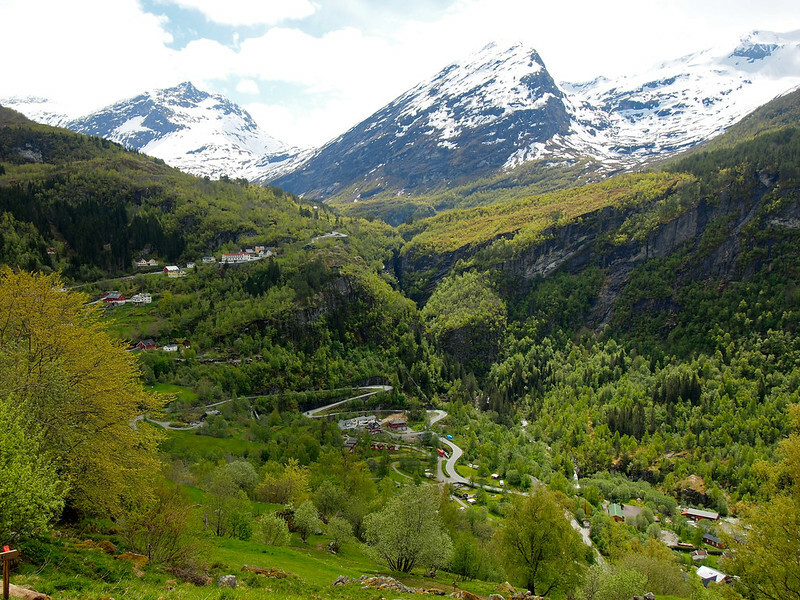 This is a stretch of Road 63 out of Geiranger that boasts 11 hairpin turns and a gain of almost 2,000 feet in elevation. 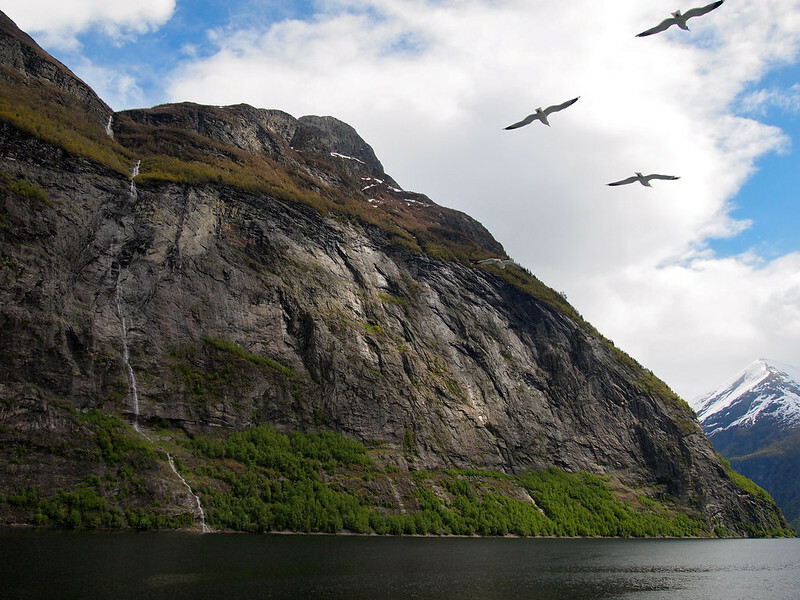 At the top, you'll find Ørnesvingen: Eagle’s Bend. I think this was actually my favorite view of Geirangerfjord because you really get a sense of just how BIG it is. Plus, the few rays of sunlight peeking through the clouds didn't hurt, either. 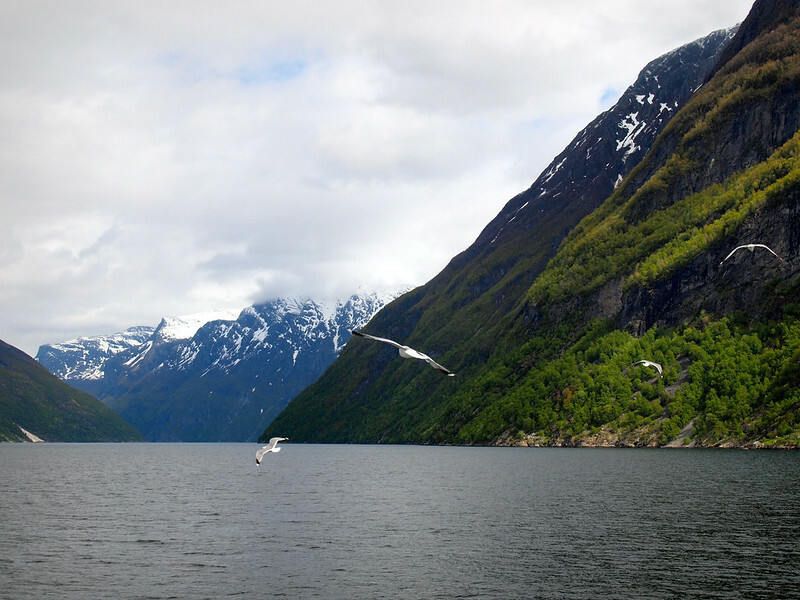 I honestly didn't know what to expect from Norway's most famous fjord. And, to be entirely truthful, if my adventure had ONLY included that bird-infested ferry ride, I may have left disappointed. 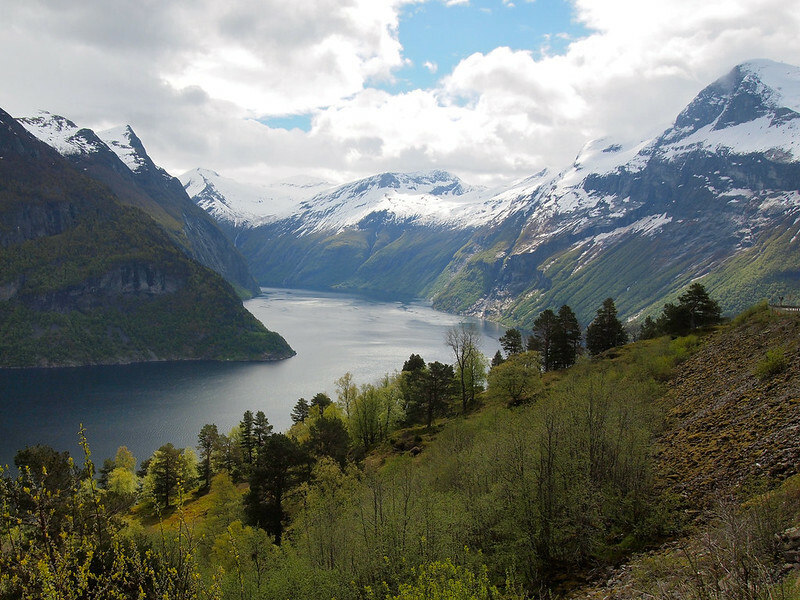 But, thankfully, there's plenty of cool things to do and see in Geiranger – and I'm really glad I stuck around to experience a lot of it! 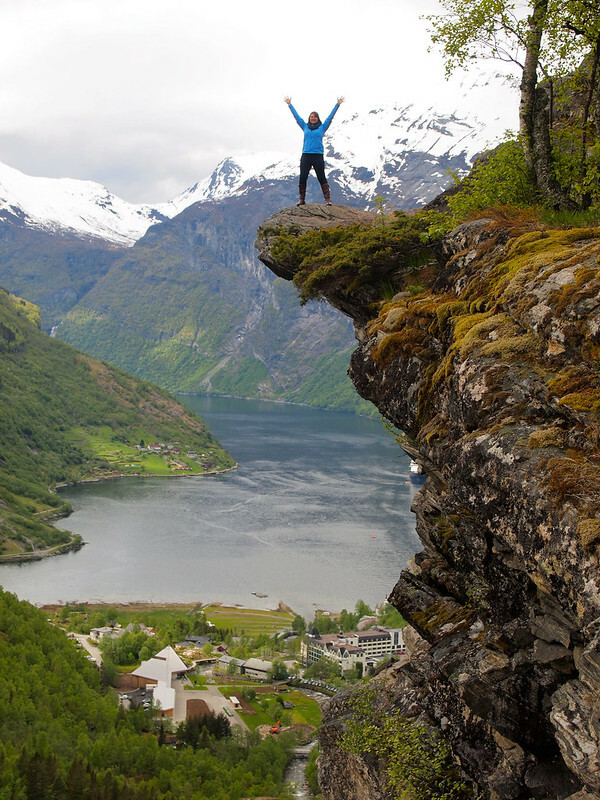 Who wants to go to Geiranger now? *Note: Big thanks to Innovation Norway and Fjord Norway, along with the local tourism board, for hosting me during my visit. As always, opinions and recommendations are 100% my own! And yes, there was only one cruise ship in that day since I was there before high season really kicked in. Late May was a great time to go to beat the tourist season! OMG Amanda your photos are amazing! Truly. 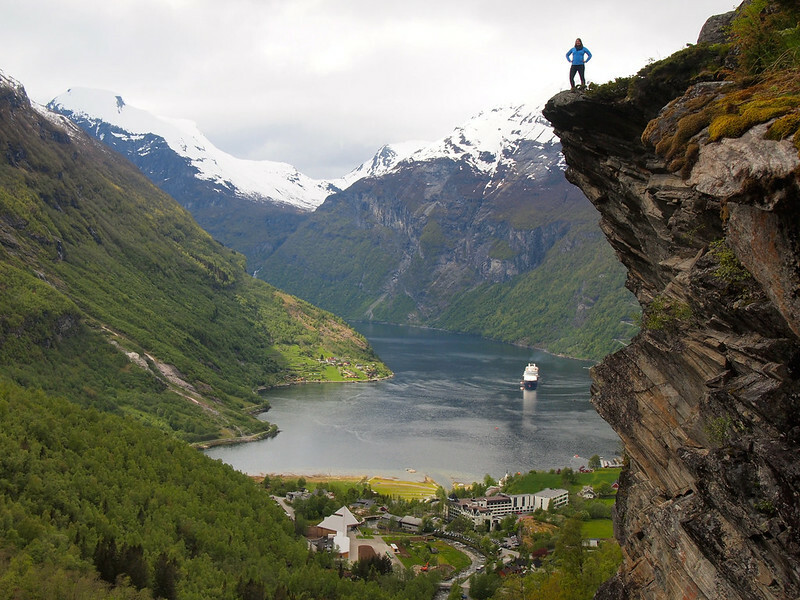 I went on a cruise in the fjords but I didn’t get to see them from atop like you did, and although that pose you struck at the edge of the cliff is TERRIFYING it is also kind of awesome. I’m really glad I got to see them from above as well as from the cruise boat! I definitely enjoyed the “above” views better! WOAH this is amazing and that shot is EPIC and totally worth a little danger. That tiny car sounds so cool too!! The Twizy was SO FUN! I wish I had use for one in real life! Haha. Beautiful! 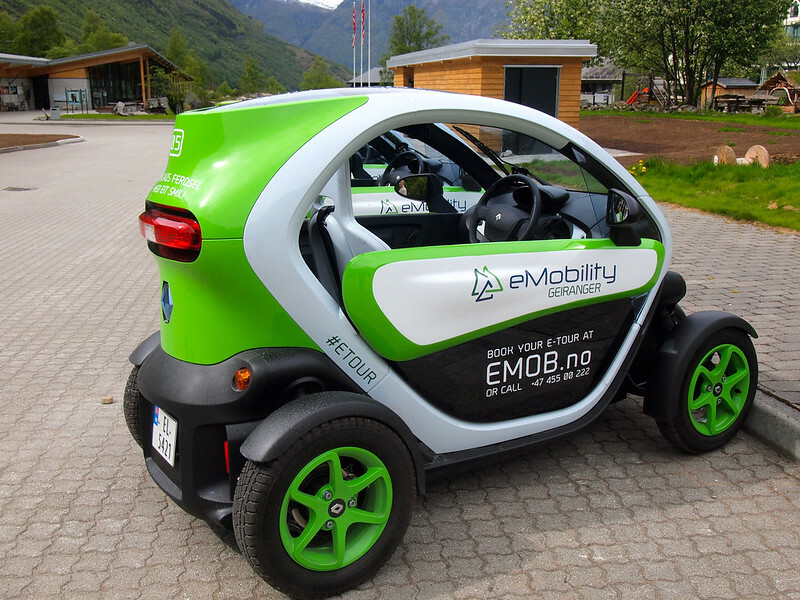 Those e mobility cars are so cute as well, plus I love that you can use to get some places that regular cars can’t go. Don’t know if I’d be brave enough to take THAT photo, though! The cars were adorable, and it literally was impossible to avoid smiling while driving them! Wow, fantastic photos, I’m very jealous of your trip and would love to visit the Norwegian Fjords! It looks stunning, and also reminds me of New Zealand’s Fjordland! this is just one more destination to add to my ridiculously long list of places to visit when I finally return to the UK! Norway would be just a short hop for you from the UK! Definitely worth checking out. Haha, the “edgy” photo was much less scary than it looks (I promise!). Really glad I got it though – still kind of can’t believe I was really there! We were on a cruise last month that included some Norway ports. Unfortunately it didn’t go up as far as Geirangerfjord (poor us, we went to Iceland instead – first world problems, right?) but we fell in love with what we saw of Norway and a visit is definitely on the agenda. 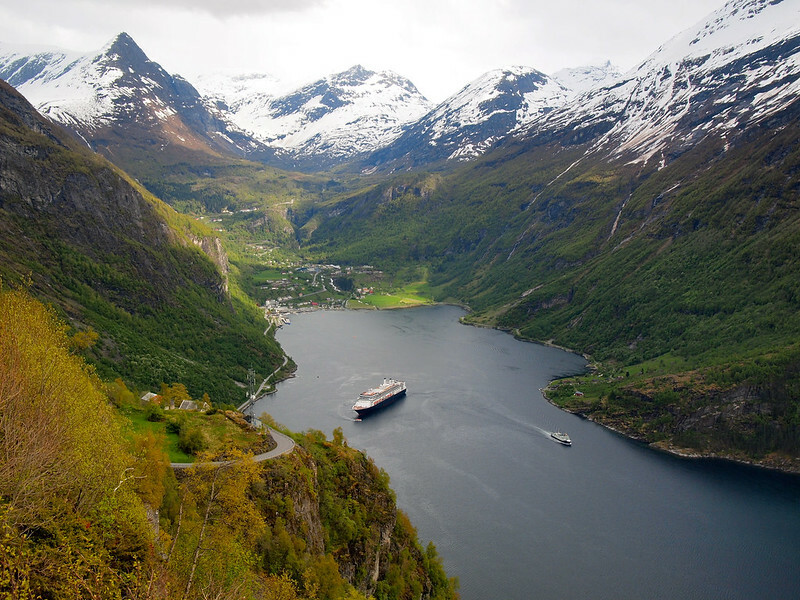 When we do, it will definitely include both Bergen and Geirangerfjord! It’s definitely not a cheap country to travel in. But I think it’s worth it! Norway has literally been the top of my bucketlist for as long as I can remember. This post only expanded my wanderlust. Can’t wait to be there this time next year! OMG! The view looks absolutely gorgeous! The landscape and water is what the Nordic States do so well. Nature, animals, peace and serenity. Yup, Norway certainly does scenery well! Some of these viewpoints certainly aren’t for those who are afraid of heights! But so so amazing. I’ve completed my undergrad in Norway. This country is heaven to me. By the way these photos are too much attractive. Nice photography. 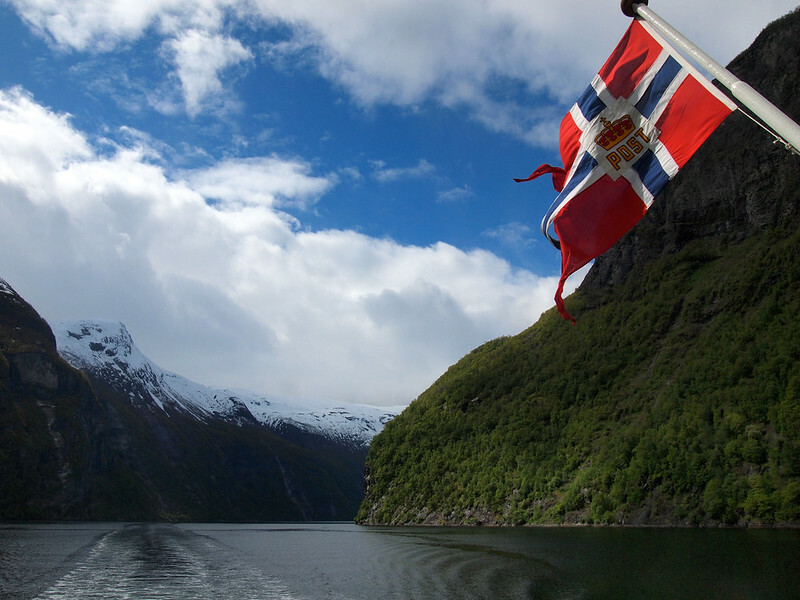 Ok – I have GOT to bump Norway up on my bucket list – your photos are stunning, thanks for sharing! Ahhh it’s such an awesome country! Definitely bump it up on your list! Just got back from Norway, although I visited Naeroyfjord instead. Sad I didn’t have enough time to visit Geiranger but hopefully next time! Really liked Naeroyfjord though so I’m so curious to visit this one. Hey love your pictures. 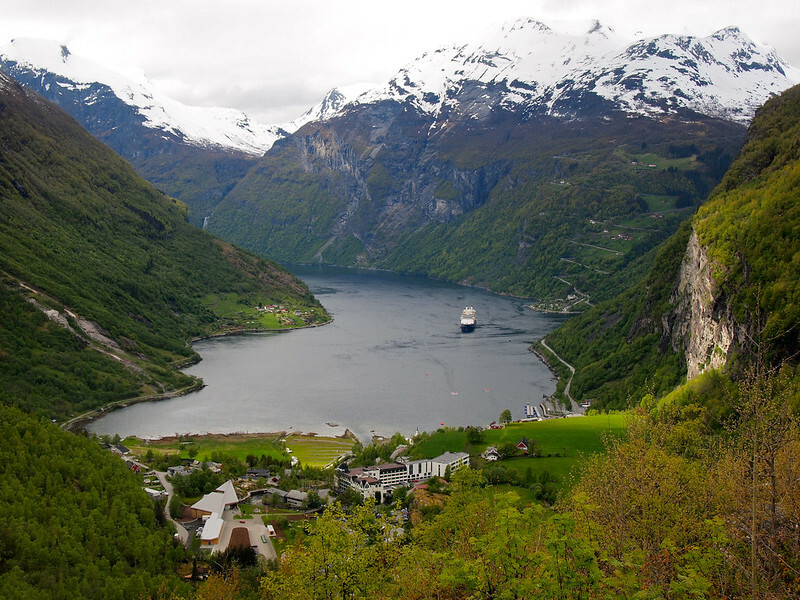 Am hoping to go to Geiranger this weekend. Can I ask how many days you stayed here? I am hoping to do just a day trip and wondering if that is possible. Thanks!! I was just there for a day! I took the ferry there in the morning, spent the afternoon exploring, and then stayed overnight in Norddal (which is about 35 minutes away). Two days would probably be ideal if you have a car or want to do some hiking. Hi! I’m currently planning a trip to Norway and was wondering how long your ferry ride was? And which company did you use? I took the ferry from Hellesylt to Geiranger, which takes a little over an hour. I believe my ferry was with Fjord1 since I was on the car ferry. Amanda – What a great blog! My husband and I just retired (in our early 50’s) and one of our goals is to see as much of this world that we live in as possible. We love cruising, and will be cruising to Norway and the Baltic area in May. 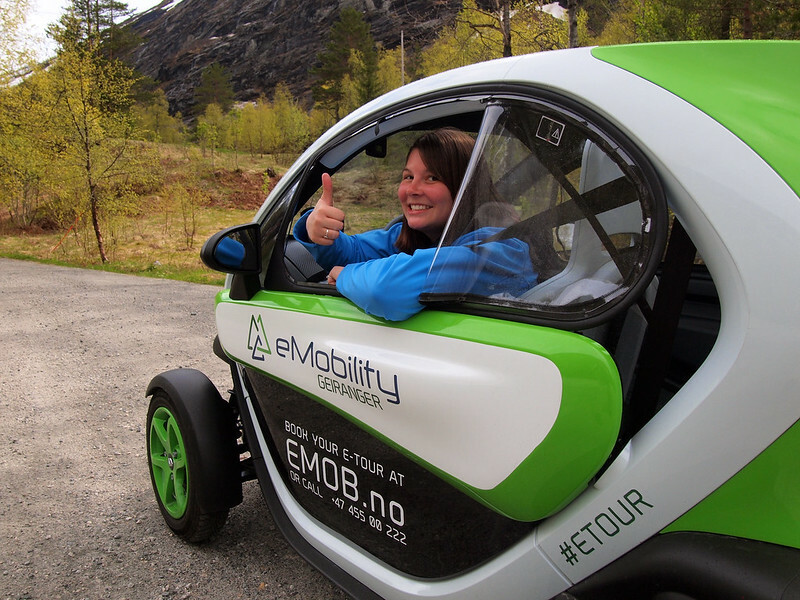 When we are in Geiranger (early May) , we have made contact with emobility to rent a Twizy. Here’s a question for you: While I know the weather is completely unpredictable, based on your experience, what time of day would you rent the Twizy. We will be in port from 7A – 5P, so we could rent the car morning, mid-day or afternoon. I would just love some feedback from someone who has recently done this! Thanks for a great blog – can’t wait to read more! Amanda, as others have remarked in earlier posts, you’re photos are fabulous–and laser sharp in all 3 blog posts I’ve read. May I ask what camera you use? Or anything special you do to get such sharp photos? I’d like to start (restart) a blog emphasizing my passion about native (yay!) and invasive (boo!) plants. In April and May I’ll be in Rhodes and Crete, which has great plant diversity. Killer photos of the plants as well as beaches, mountain villages and Greek Orthodox Easter village activities would really make the blog posts come alive. 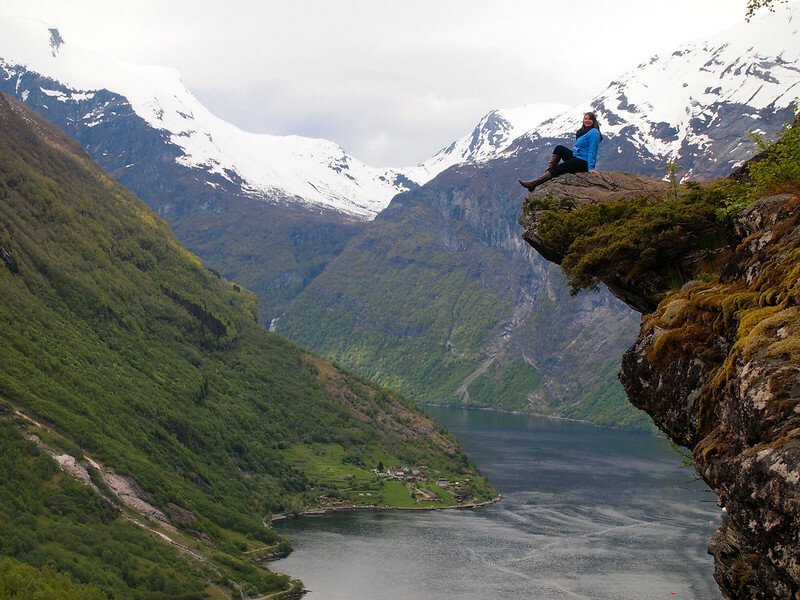 Loved this post on Geiranger Fjord. 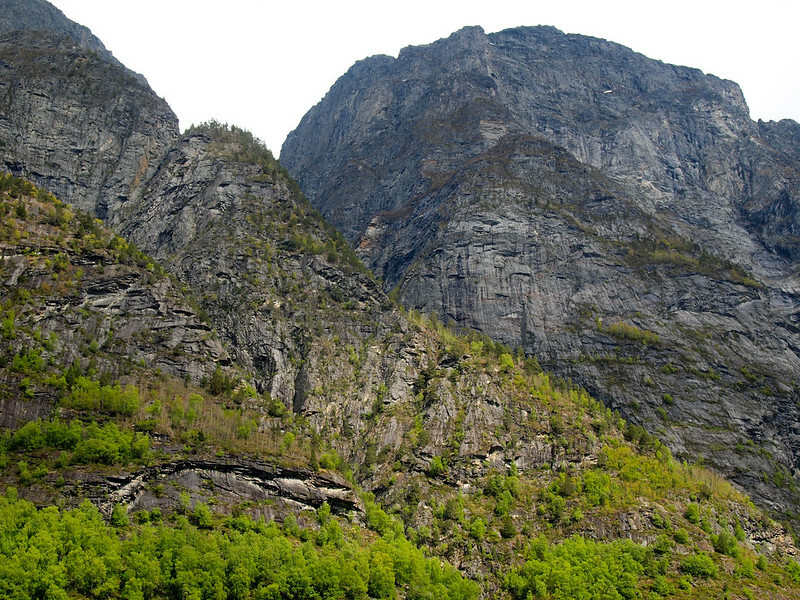 I spent 3 weeks backpacking around Norway in early to mid-May 2001, with 3 days in Geiranger. The tourist season didn’t start until the 18th so no tourists except those on the single cruise ship each day. I walked up (and back down) the winding road to where the Queen’s Chair is now. Worth the effort if you are a waterfall and wildflower fanatic. And the darling goats and sheep were all over the hillsides and my photos. Hey Linda! I’m currently using an Olympus OM-D E-M5 Mark II camera (http://amzn.to/24uE5SN) with a 12-40mm Pro lens (http://amzn.to/1TelCGF), though these photos were actually taken on an older (no longer sold) camera. I love Olympus’ mirrorless cameras – small, but mighty! Great post! I’m planning a trip for next summer and have 2 full days (plus whatever time we get in the day before!) in Geirangerfjord. I’ve been dying to get up to that little ledge over the 12″ fence – how did you get there? Is it easy to find? Nice! So, to find the spot, you have to go to the upper part of the Flydalsjuvet. Then you walk all the way to the left, hop over the fence, and have to make your way through the forest a bit until you find that outcrop of rock. Thank you for providing a ‘walk in my shoes’ experience of your travels in Norway and Iceland. I am travelling there next winter and your post has helped to make the most of the limited time we have there. I really appreciate your insights of each place – rich with details on how to get the best experiences. Impressed that you got to see aurora in colour versus only with camera. Love your photos and love Olympus – will need to upgrade mine. How did you manage camera and batteries in the cold? Happy travels. Yes, another commenter asked this, too. So, to find the spot, you have to go to the upper part of the Flydalsjuvet lookout (which has a parking area and everything – easy to find). Then you walk all the way to the left, hop over the short fence, and have to make your way through the forest a bit until you find that outcrop of rock. 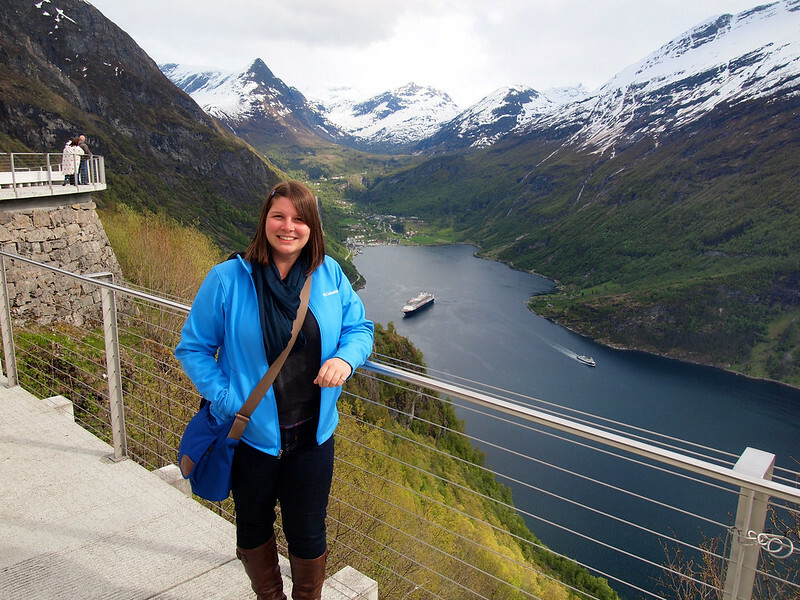 Hi Amanda, the article is really useful for my trip planning, being one of the rare blog that shares great info on things to do around Geirangerfjord. May i ask the exact location of the edgy photo you took? i can’t seem to locate it. Hi Jerry. That was taken at the upper lookout of Flydalsjuvet, which shows up on most maps. But, like I said, I DID have to illegally climb over a low chain-link fence and walk through the forest a bit to get to that specific piece of rock. So be careful!